Jenik Radon ’67 speaking at the World Leaders Forum in 2009.PHOTO: KONSTANTIN TCHERGUEIKO ’10 GSASRadon majored in economics, eventually becoming involved in international corporate law. His practice, Radon & Ishizumi, is based in New York. But the age-old question has driven him to help young nations around the world open their markets, build constitutions and gain independence. Radon, an adjunct professor at SIPA, is organizing a major conference on Chinese integration into the world, to be held within the next year in Estonia. He also is helping emerging nations such as Uganda and Malawi develop their extractive industry laws and is active in a nation-branding project in Mexico, where in October he sponsored the Mexican Bicentennial Independence Conference. “Image-building is a part of nation-building,” Radon says. Radon then became involved in Eastern Europe by helping write privatization, foreign investment and commercial laws for countries such as Poland and Estonia, and leading negotiations for an international pipeline in Georgia. 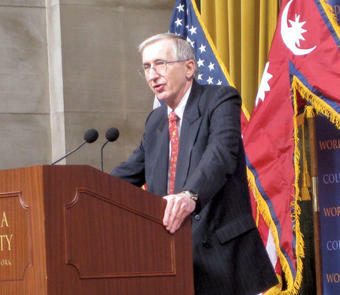 He also drafted the constitution that helped bring an end to a decade-long civil war in Nepal in 2006. Radon graduated from Stanford Law School in 1971, where he met his late wife, Heidi. They married that year, moved to New York and had a daughter, Kaara ’95. Radon did corporate legal work in the 1970s and founded Radon & Ishizumi in 1981. After presenting a paper on Polish joint ventures in Washington, D.C., in 1980, he was invited to lecture in Poland, where in many places he was the first Westerner officially invited to speak. On the basis of his work, Radon was asked to write the foreign investment laws for Poland in 1986. As the Estonian independence movement accelerated, Radon advised the government and co-authored the privatization and foreign investment laws that would lead to a free-market economy. He officially raised the American flag at Estonia’s American Embassy, a daring move when Estonia was still part of the Soviet Union. In the 1990s, Radon worked for Georgia, acting as lead negotiator for a multibillion dollar international pipeline, the BTC, that would run through the country. In recent years, Radon has worked on helping underdeveloped nations use their natural resources without suffering human rights violations from multinational corporations. He has been writing articles outlining core abuses committed by the extractive industry in developing nations. Atti Viragh ’13 GS is studying English and comparative literature.